Centri-flo with EC motor showcases the benefits of EC technology and its application to horticultural environments. EC motors are a very powerful and cost-effective ventilation solution. They typically use up to, an impressive, 35% less energy than standard AC motors. They also offer very low noise levels, especially at low speeds. Blauberg EC motors have an added benefit when used in conjunction with carbon filters and long duct runs. By utilizing EC and DC technology, higher airflow rates can be achieved when the fan is operated at lower speeds, ensuring a significant increase in air change rates. 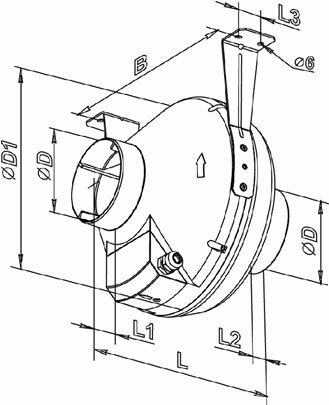 EC motor with a centrifugal impeller and backward curved blades. Built-in, smooth, step-less speed controller ensuring 0 to 100% proportion control.